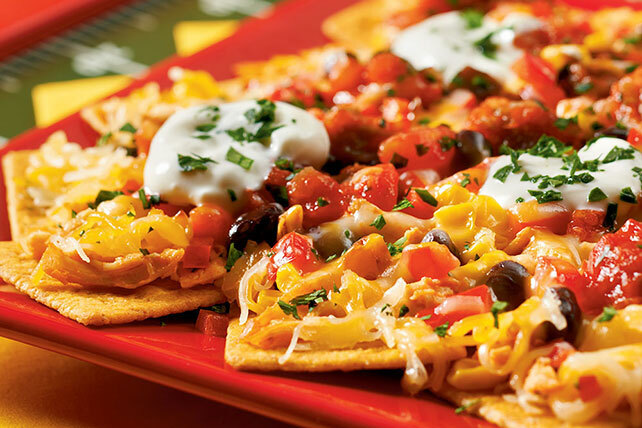 A hearty blend of shredded cooked chicken breasts, black beans and thick and chunky salsa gives these Southwestern Macho Nachos their name. Toss chicken and hot sauce; set aside. Place half the crackers in single layer on microwaveable plate. Top with half the chicken mixture and half of the next 4 ingredients. Microwave on HIGH 1 min. or until cheese is melted. Top with half of the sour cream, salsa and cilantro. Serve immediately. Repeat with remaining ingredients. Heat grill or grill pan to medium heat. Remove husks and silk; discard. Grill 15 to 20 min. or until corn is tender, turning frequently to prevent from burning. Note: Turn corn when grill marks appear. This recipe makes 2 plates of nachos. Make one and when your guests are done, repeat the recipe.